15 backers pledged $4,090 to help bring this project to life. Thanks for checking out my project to commemorate the un-sung mouse! Join me in celebrating the amazing sacrifice mice make in the natural scheme of things. With your help I plan to populate the earth with these immortal mouse spirit bronzes by getting molds made and foundry casting underway. This follows on from my recently successful Kickstarter project (thanks again for that!) to add some new rodents to my mouse family, which you can see HERE. Up, up and away that is, with the addition of some heavenly wings. Consider the humble mouse: Animal species-wise on planet earth, never has so much been owed by so many to so few (I'm starting to sound like Winston Churchill). I wanted to pay homage (not fromage) to the mouse's frequently dubious honor as link number one in food chain! So I'm doing it with three new sculptures. 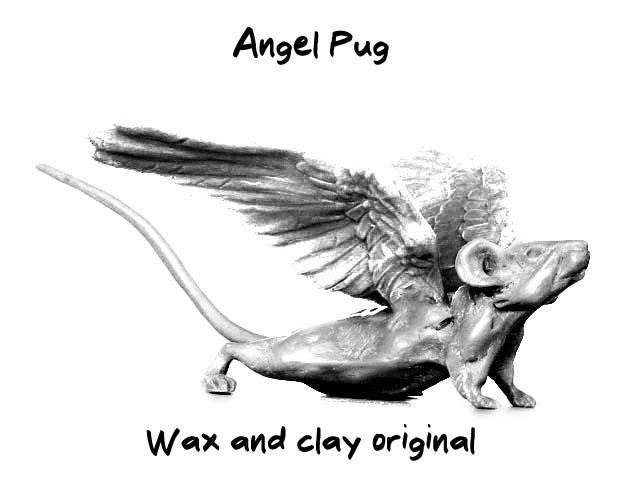 Angel Pug, Winged Sprightly, and Angel Chubby. 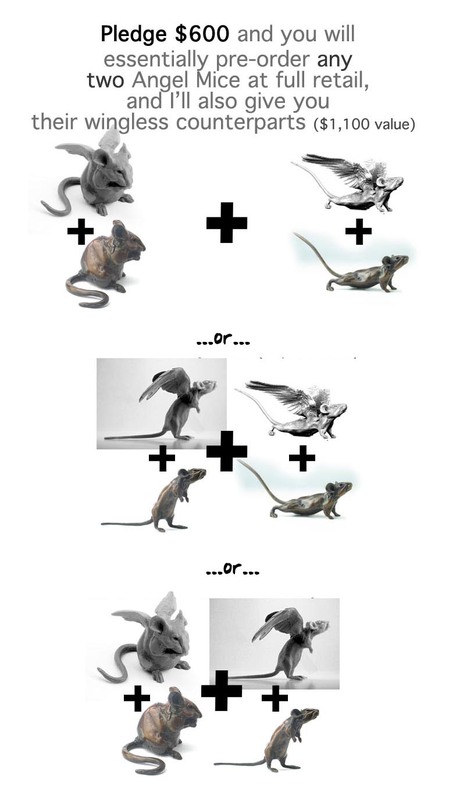 My winged mouse evolution has been the result of my usual careful study. Each has been elegantly designed and crafted with love. I'm not content to create things you could walk past and just ignore. I believe that the love poured into these will act as a beacon; a tractor beam of passion if you will, that will draw others in to appreciate these humble rodents and their solemn plight. When I recently had a few mice cast and finished with a silver colored patina, I was immediately taken by their ethereal aspect. 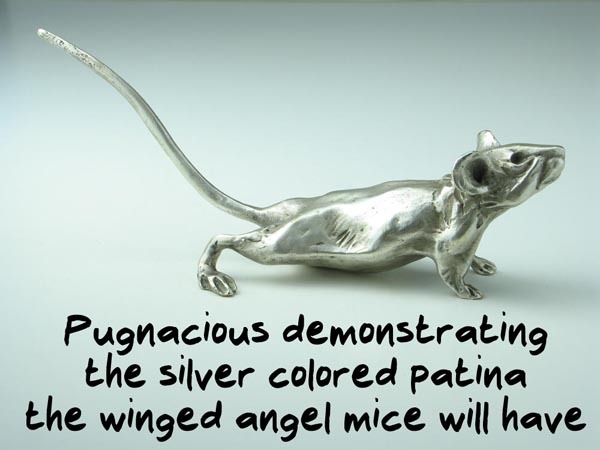 I've long wanted to do a series of winged mice, and seeing my silver ones immediately fueled an uncontrollable urge to see the project through. For me that the best time to make art. So having thrown myself into making the originals, all that remains is the expensive part: molding, pulling waxes, chasing the waxes (that's a technical term, so you'll be excused for picturing small groups of artisans with butterfly nets, racing about after winged escapees), bronze casting, metal chasing (there's that technical term again), and patina. Finally, with your help, the mice will be solemnly wrapped in black tissue and ceremonially released onwards to their new homes. So if you find that appealing and would like to make a pledge, you'll be essentially pre-ordering one or more of them (depending on your pledge) at around half of their future retail prices when they will become available through galleries and my Etsy store, CritterVille. Or pledge the full retail price and in addition receive the wingless earthbound counterpart (also in bronze, only with a traditional brown patina) as my gift to you. 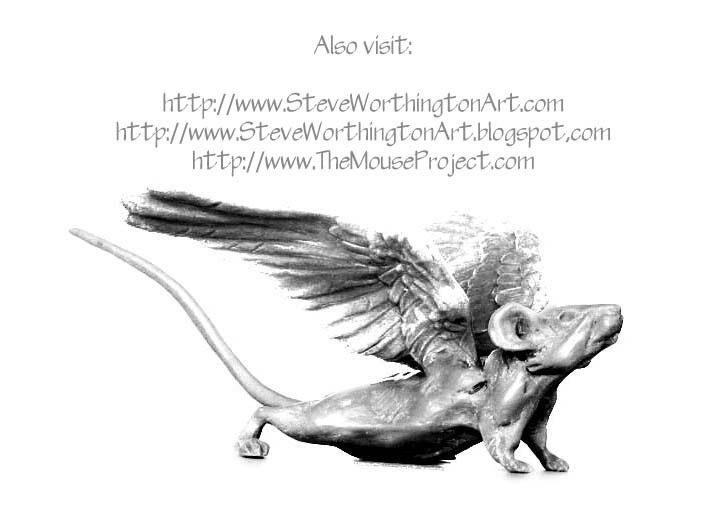 If you are curious about the mouse paintings festooning my creative environment, click HERE. 'Sprightly, Nosey and Chubby already occupy around half of the continental United Staes. Adventurous Sir Ranulph Sprightly has out done real mice by visiting Antarctica and the South Pole. There are no other rodents there. They've also made it to Australia, Sweden, India, Japan, England and other places. These fertile bronzes are itching to get out there to disgust and delight, in equal measure! Before sculpting began, an assiduous study of mouse anatomy was undertaken. As with the subjects of my previous bronze mice, their movement and behavior was studied closely so that every touch of the clay would add character and style to their distinct personalities. My goal has been to make the most engaging and artistically authentic bronze mouse collection the world has ever seen. The artists I have most admired and that have inspired me throughout my life (although they are not necessarily known for their mice) include Michelangelo, Leonardo, Rodin, Antoine Louis Barye, Rembrandt Bugatti and others, along with Gary Larsen and Charles M Schulz to name a few. It has always been my intention to absorb only the best influences I'm capable of honestly appreciating. So these mice stand as testimony to my life as an artist. Anyhow, thanks for checking out my project, I hope it pops your cork! 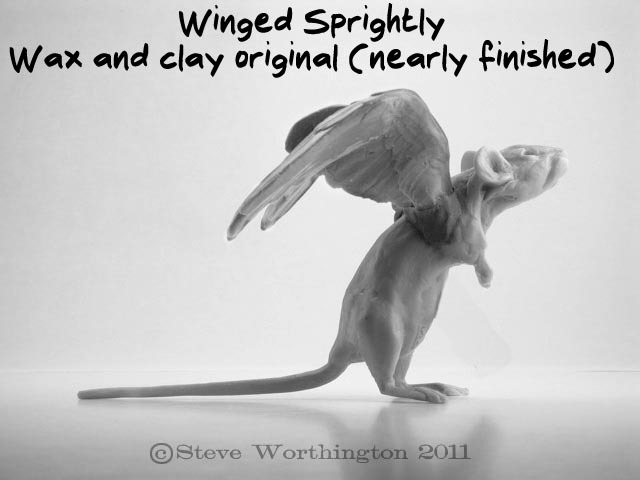 For a $150 pledge you are pre-ordering and will receive your choice of any one Angel Mouse. This includes shipping within the U.S.A. For shipping to Canada and other international destinations add $20 to the pledge amount. 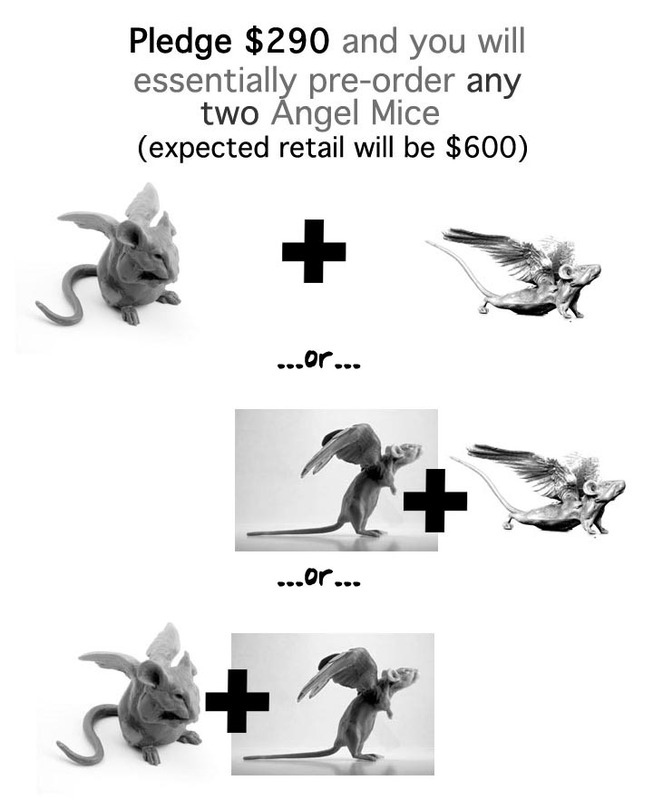 For a $290 pledge you are pre-ordering and will receive your choice of any two Angel Mice. This includes shipping within the U.S.A. For shipping to Canada and other international destinations add $20 to the pledge amount. 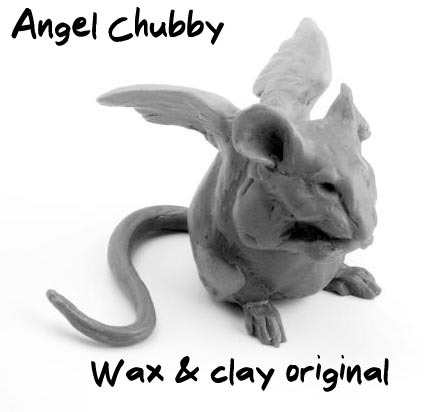 For a $300 pledge you are pre-ordering and will receive your choice of any one Angel Mouse at its future retail price, and I will also give you its wingless counterpart. This includes shipping within the U.S.A. For shipping to Canada and other international destinations add $20 to the pledge amount. 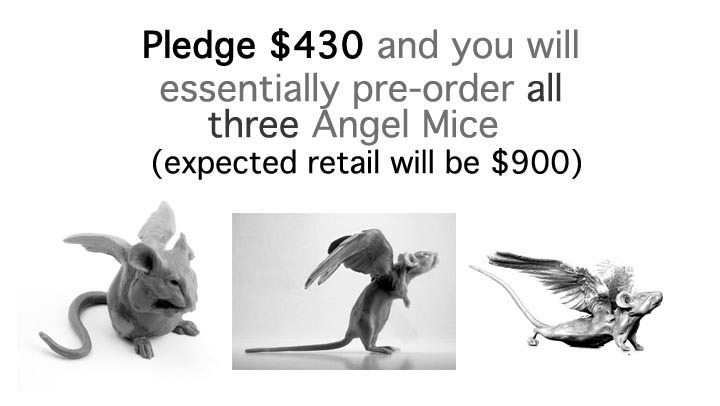 For a $430 pledge you are pre-ordering and will receive all three Angel Mice. This includes shipping within the U.S.A. For shipping to Canada and other international destinations add $20 to the pledge amount. 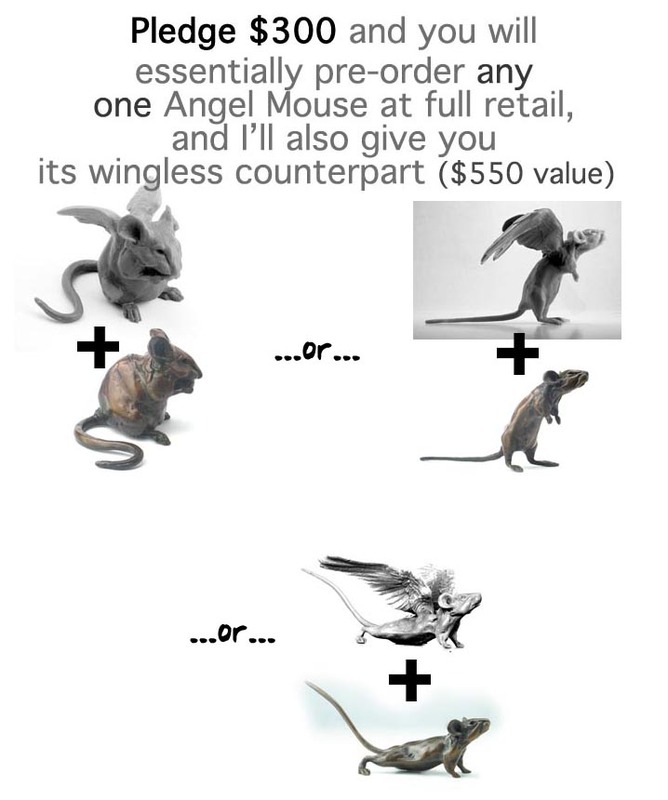 For a $600 pledge you are pre-ordering and will receive your choice of any two Angel Mice at their future retail price, and I will also give you their wingless counterparts. This includes shipping within the U.S.A. For shipping to Canada and other international destinations add $20 to the pledge amount. Get it all! 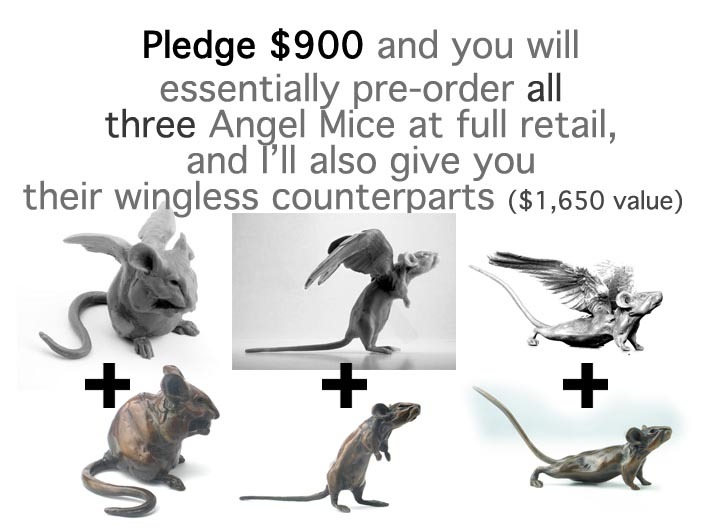 For a $900 pledge you are pre-ordering and will receive all three Angel Mice at their future retail price, and I will also give you their wingless counterparts. This includes shipping within the U.S.A. For shipping to Canada and other international destinations add $20 to the pledge amount.